The Program for Narrative and Documentary Practice opened its Wonderland exhibition in the Slater Concourse Gallery. The students' work, from the Fall 2014 class, will be up through the end of October. The Wonderland exhibition is about the past and future, about dissolution and transition, about how historical narratives can be found in neglected places. Using the site of the old Wonderland Amusement Park as a jumping off point, PNDP sent its students out along Route 1A north of Boston, and then winding back to Tufts, to explore the places many usually drive by but rarely stop to see. 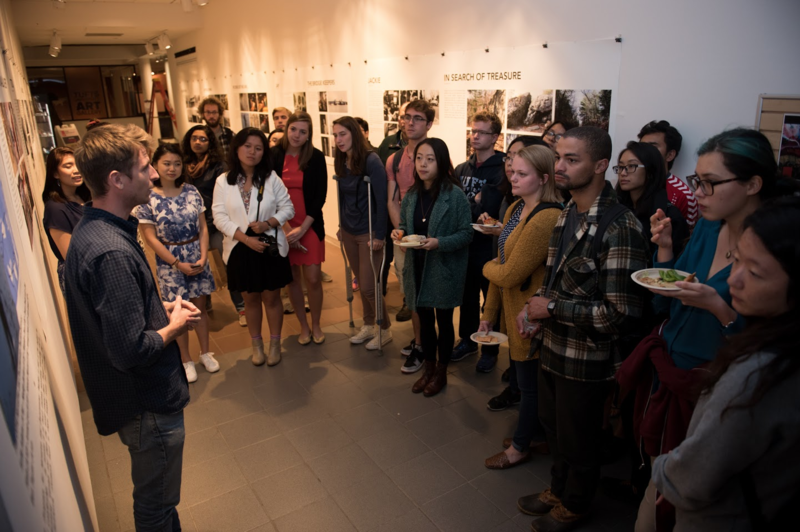 The class, led by instructor and photographer Samuel James, encouraged students to venture to the in-between places of overlooked communities around Tufts and to tell the stories they found. The location-driven, photographic narratives the students produced shed light on stories – people and places – that often go untold. These stories coalesce to narrate an overall, intertwining story of Boston’s north shore.